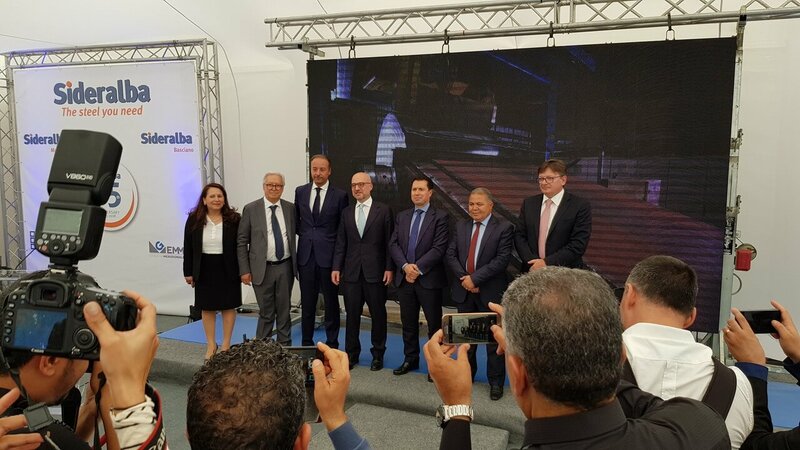 Bizerte, May 13 2018 – Today Sideralba Maghreb, company owned by Rapullino Group, has officially unveiled the plant of 100,000 m2 for realization of high-quality steel to the Tunisian institutions: the Tunisian Industry Minister Slim Feriani, the Governor of Bizerte Mohamed Gouider and to the Italian ambassador Lorenzo Fanara. Together with Tommaso and Luigi Rapullino – respectively founder and CEO of Rapullino Group – a large number of guests and employees took part in the ribbon cutting ceremony for the restart of the plant, acquired in 2017 by the Group from Naples, which represents the most important foreign investment in Tunisia made over recent years. Before his arrival, the Ambassador Fanara has delegated Mr Sandro Fratini to read a message from the Italian Foreign Minister Angelino Alfano who, in addition to express a great satisfaction for the excellent results achieved by Sideralba, also has explained that only with an intensive economic and cultural cooperation the fanaticism be kept away from our lands. Following Governor Guider and Minister Feriani expressed satisfaction for recovery on foreign investments in Tunisia, saying that the investment of the Italian Group is an example of how big companies can find a Nation ready to welcome and support them. Ambassador Fanara expressed great satisfaction: “The investment of the Rapullino family must be followed by other Italian companies. Tunisia is a Nation that is experiencing a “brave” cultural transformation and it must be rewarded. Finally, Luigi Rapullino greeted the audience: “For Sideralba Maghreb the production of Bizerte is an important step. Today, by presenting our production to the Tunisian authorities and to the world, we prove our value and the quality of our work. The Group, made up by 600 women and men, with their expertise and passion contribute to daily success, have shaped this goal. So from now on, all around the world ships will sail with our coils together with our other production of pipes and fences. Bizerte Sideralba will ship vessels of their 300,000 mt of coils produced in Tunisia plus the offer of tubes, profiles and gratings produced by the Italian plants of the Group. This investment will allow the Italian company to employ totally 350 local people led by the Italian management, who moved to Tunisia for a few months. The company management is aware of the social value determined by the restart of one of the most important Tunisian steel industries and expects to establish an active and constructive cooperation with the political world in support of entrepreneurial activity and its development. Sideralba Maghreb is a steel company active in the Tunisian and International scene: belongs to the Rapullino Group which produces and sells 600,000 tons of coils, tubes, strips, sheets and open profiles. The Group is composed by about 600 employees spread over four production sites in Italy and Tunisia. The group, founded in 1993 in Caivano (Naples) as an “artisan” company, immediately gained leadership in Italy in the processing of galvanized coils in the construction and agriculture fields. In 25 years of activity, it has been able to transform itself, always in keeping customer satisfaction and the pride of its Neapolitan roots.